Google Fit is certainly in its infancy and in some ways it feels that way. Equally though there are some very powerful elements to the app and the clean interface with more detailed data tucked away in it certainly has appeal. The support for Android Wear is a plus and the fact you can get to your Fit data on the web is another plus. That said, even with the tucked away data, there are still elements that other tracking apps do better and provide more robust information. One of the big benefits for those who are fully immersed in the Google ecosystem is that all of your activity information is stored in one account, your Google account. As this app grows, that single sign-on will prove to be even more beneficial. When compared to some of the more advanced activity tracking apps available in the Google Play Store, Google Fit seems pretty basic. And it is. While designed to be a hub of all your physical activity, Google Fit has some growing up to do. Yet there is a simplicity about the app that makes it a joy to use. It’s not cluttered with endless bar charts or huge amounts of data shoved in your face. The data’s there, but tucked away so you only focus on the here and now. 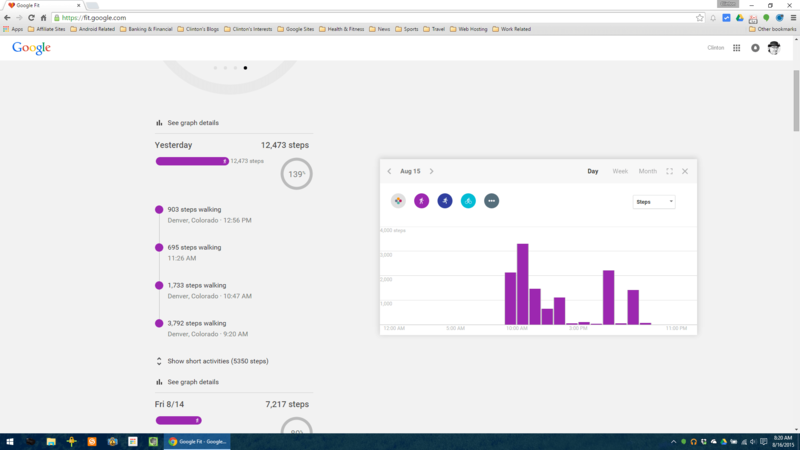 I’ve been using Google Fit for the past several weeks as I explore its benefits and its limitations. There are plenty of both and if Google continues to build on it as they have done over the past few months, it will be a powerful application for you to keep track of your steps, miles walked, runs, swims and other activities along with your weight. Plus, there are already other apps like Withings and RunKeeper that plug into Google Fit to be that central hub of activity. And it’s free and with Android Wear support, the future is bright for this app. But you will need a bit of patience for now. 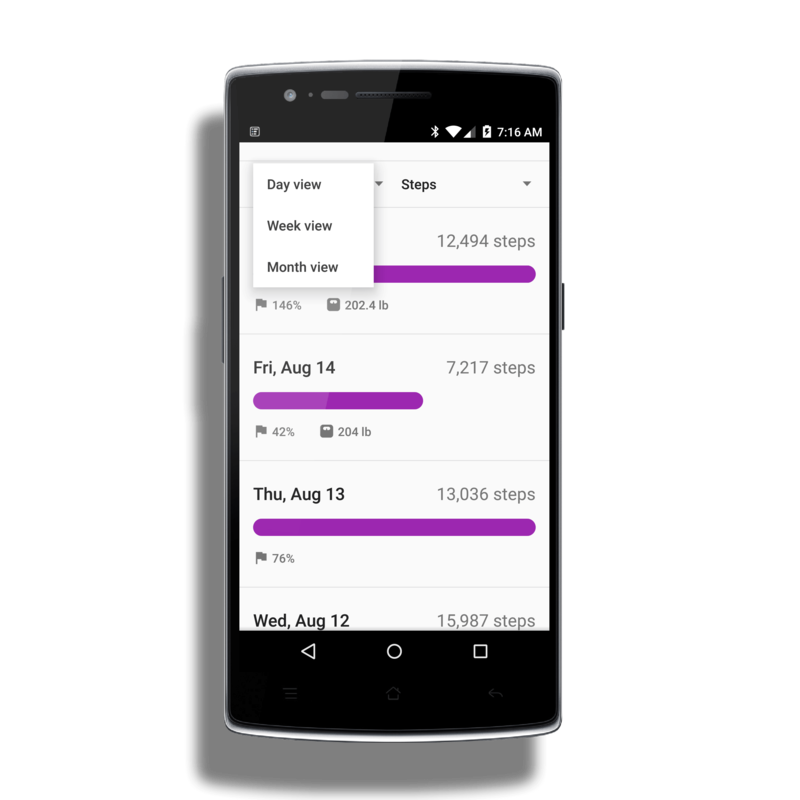 Google Fit is a small 29MB install for your Android phone running Android 4.4 or higher. Along with the install is the version for Android Wear and when you sync up your Wear device, Google Fit will be installed on that device at that point. The install on your Android Wear device is under 3MB. 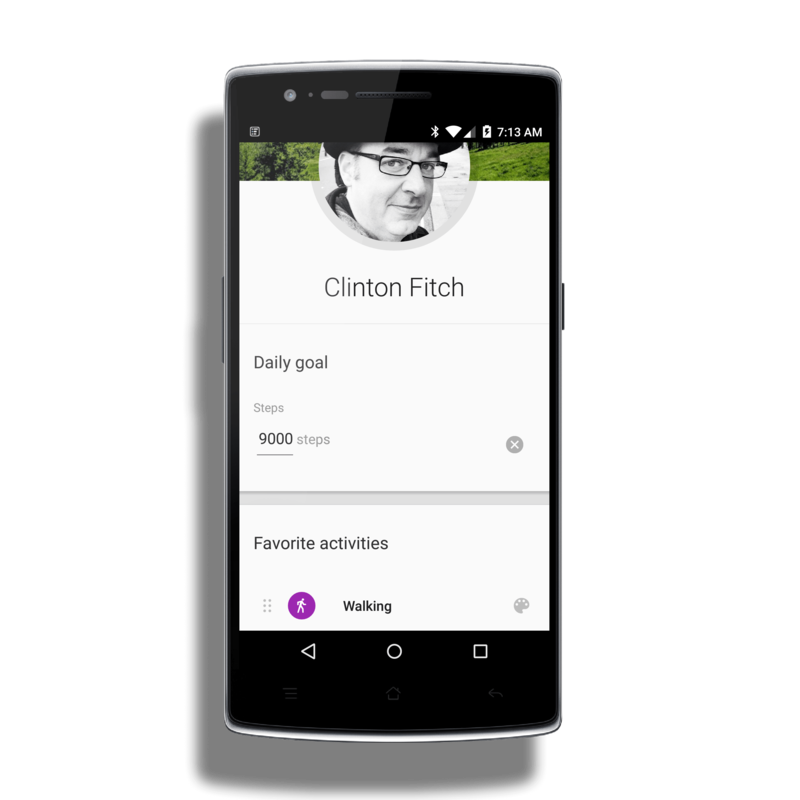 When you start the app, you will be prompted to setup your daily goals. This can be a measurement of steps, miles walked or run, calories burned or time you were active in the day. Which one to setup is really a matter of preference. I personally set things up to measure steps. In addition to your goals, you will also be prompted to setup your personal information such as your height, weight and gender. This information will allow Google Fit to more accurately measure how many calories you are burning during your activities. 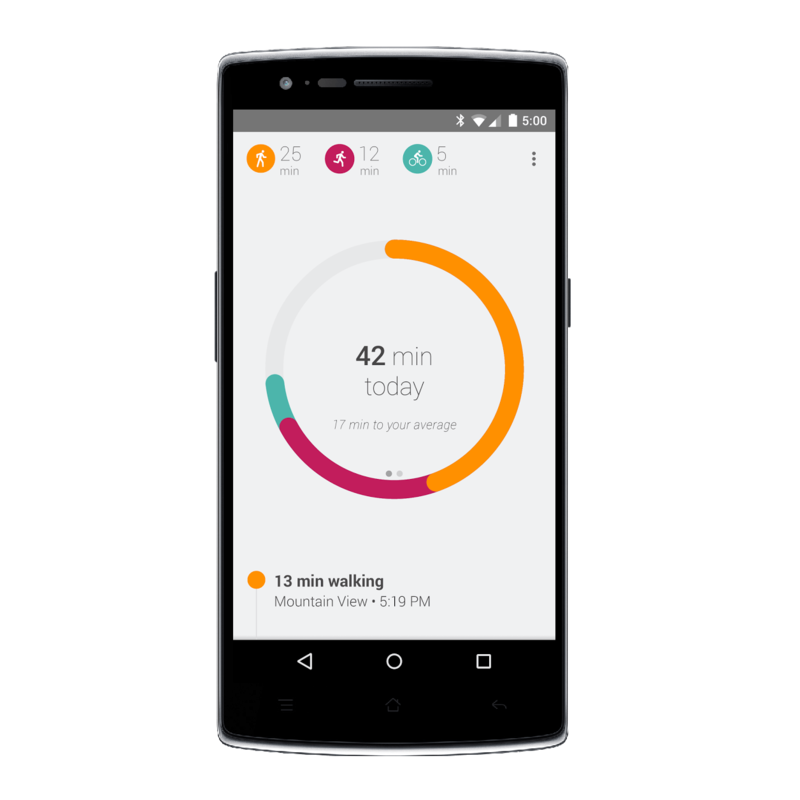 Google Fit leverages the accelerator in your Android phone to measure your movements and activities. If you are using an Android Wear device then it will use the pedometer built into those devices. Google fit can also take advantage of High accuracy mode in most Android phones today which will improve your distance and location tracking which will result in more accurate tracking of your activities. of these trackers to be 100% accurate. If however I depend on my Moto 360 for tracking my steps, it will be under by as much as 75% sometimes. A great smartwatch the Moto 360 is. A great pedometer the Moto 360 is not. But that isn’t really the fault of Google Fit so I have to careful assigning blame. For me, I have found my most accurate results with Google Fit to be when I have my phone in either my front pocket or my hip pocket. Yes that means that I have to have my phone with me all the time when I’m walking but let’s be honest: I already do. It’s not that big of a deal for me. I’ve also found that the app can accurately measure my steps if I’m holding my view and viewing it as I walk but the pocket is a bit more accurate. One thing I do like about Google Fit is that it can automatically detect if I’m walking or running or cycling and change the activity list in the apps user experience. For other activities you can manually enter them to track them. It will also give you a calorie burn estimate for those added activities automatically and add them to your daily totals. on the calories I burned (which is a good thing generally) than Fitbit but on any given activity, they were usually within 5-10% of each other. Again, I generally look at all activity apps and devices as having a bit of give and take on accuracy so I didn’t have much heartburn over the differences. 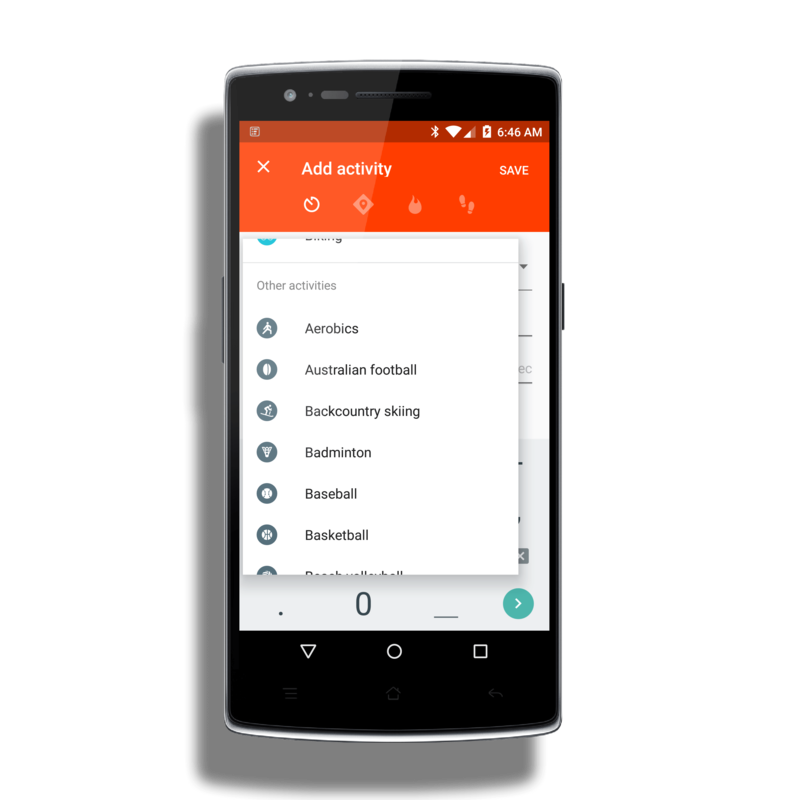 The one big prop I will give to Google Fit is the huge number of activities you can add to your daily total. There are some really common ones and some really obscure ones so chances are, unlike other activity tracking apps, you can probably find it in this one. While not necessarily an activity, you can log your weight with Google Fit and I recommend you doing so if you are going to use the app regularly. Like other activity tracking solutions, Google Fit will calculate your calorie burns for activities based on your height and weight. Keep this data accurate means you will get a more accurate measurement of how many calories you are burning during the course of the day. 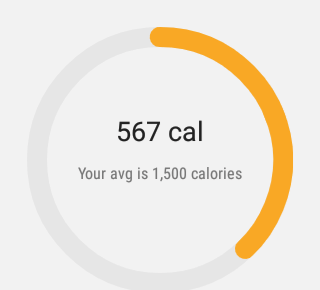 One of the beautiful elements of Google Fit is the simplistic, dare I say minimalist, user interface. Set on a white background, your activity meter for the day is a large circle in the middle of the screen. Swipe left and right to move between the different measurements such as steps, miles/kilometers walked, calories burned and total time you have been active. Scrolling down the page will show you a list of your activities that comprised the day. If you continue to scroll down you will see the ability to view charts of your various activities for the day, week or month. You can scroll left and right to see data points from other days in the charts. Like any activity tracker, the data that is there is only going to go back as far as you have been using the app. Google Fit is not any different so it will take a few months of regular use to build up these charts with any trending or meaningful data. don’t want to see them, I don’t have them right in my face. It’s a simple thing but one of the elements of this app that I appreciate. 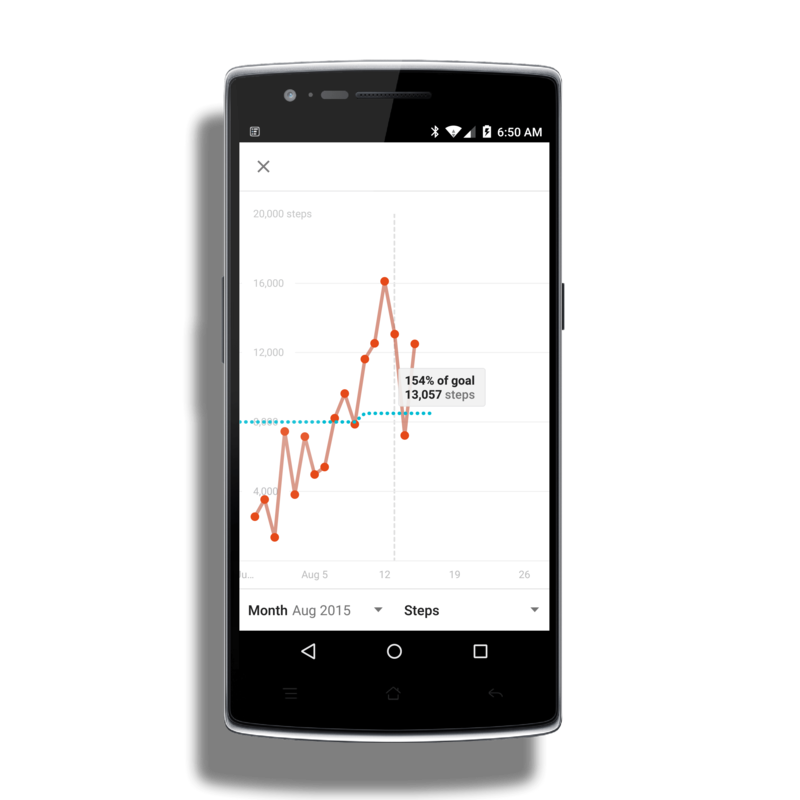 How you view historical data in Google Fit is customizable to your liking. You can view your history by Day, Week or Month and the information you are provided when you select that view mode will vary. For example, I most often use the Day view mode. When I tap on a previous day, the activities for that day are displayed. This includes things like when I was active (my steps at a particular point in a day), my weight if I entered it, and how well I did against my daily goal. Just like the chart data, it is a tap away from me if I want to see this detail or not. As you would expect, the amount of information from Google Fit that is displayed on your Android Wear device is less than your Android phone. You get all of the basics you need like steps, distances, calories burned, and time active. When viewing this on your Wear device, you have the familiar activity circle like you have on the phone app and swipes up and down will allow you to go back and forth amongst these measurements. 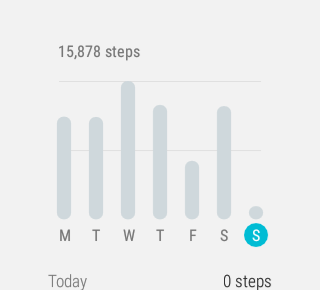 Surprisingly, Google Fit for Wear devices also gives you a little bit of historical data. If you swipe right you will see a bar chart of your primary measured mode. In my case this is the number of steps I take per day. Swipe down on this and you can see your historical data for the last 7 days in numbers. While you don’t have nearly the depth of detail that you have in the phone version of the app, to have a quick glance ability of your steps or miles over the course of the last week is handy. As I’ve pointed out in other posts about Android Wear (like my Evernote for Android Wear review), the best way to look at Wear devices and apps are as an extension of your phone. You won’t have as much data there or functionality but generally enough to get you by at a glance. heart rate while you are active, you have to stop or navigate your Wear device while walking or running to measure your heart rate at that moment. That’s not necessarily convenient nor safe if say you are cycling. Unlike other apps for Wear, most notably the Moto Body apps that come on the Moto 360, you can’t setup Google Fit to take these measurements automatically nor can you set heart rate goals. 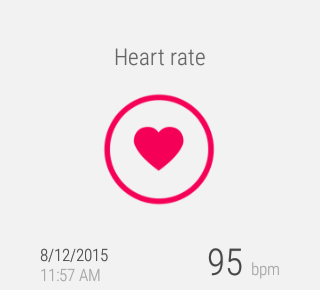 It would great to see the ability to continually monitor your heart rate come to the app in a future release. Overall the clean, straight forward interface of Google Fit both on Android Phone and Android Wear are one of the strengths of this app. You see the here and now while the display isn’t cluttered with charts and numbers. The important thing though is that the data is there and in most cases is just a tap away from you. While the main focus of this review is on the Google Fit app, I would be neglectful if I didn’t mention the Google Fit site. The site is found at http://fit.google.com and gives you the same information you can find in the app itself, just with the comfort of a larger screen. In fact you will find that in many ways the app and the site are reflections of each others, display the same content in the way you have configured in the app. My point is, don’t go look for content on the site that isn’t on your phone. It’s not there. One of the promises of Google Fit and where it could truly become the central hub for all your activity and lifestyle tracking is through 3rd party app integration. Right now this is still very much a work in progress but there are already apps that synchronize data and more are expected. The good news is that there are already some big names involved which should, in theory at least, push others to sync with Google Fit. Most often Google Fit is compared to Apple’s Health Kit and, to be fair, Health Kit is far more advanced when it comes to 3rd party sync’ing. That will change over time because personal health and activity tracking is a big part of the mobile landscape today. Likewise, we have seen more integration points with Lollipop, especially on Android Wear devices, for apps such as these which will hopefully speed things along. Google Fit is a free app and when you install it, it will install the app elements to your Android Wear device. You will need to have a Google account to use the app and service.